This is the summer when I officially admit that I am no longer 25. Everything is bugging me, you guys. Everything. The hotness and the dryness and then the wetness and now the hotness again. My poor hair. And my poor family, that has to live with me and my poor hair. And although I’m clearly on a roll here, I’m going to stop and tell you the point of my rant: It is too hot for grown-up clothes. It is too hot for long pants and jackets and sleeves and scarves and pretty much any other extraneous piece of fabric. When it’s this muggy out, I regress to the clothes I loved as a kid: rompers and floaty little dresses and shorts. Lots and lots of shorts. Fortunately, this season, shorts are having a moment. (Although, let’s not kid ourselves: We were going to wear them anyway.) Many of us live in shorts in the summer, but the fact that they happen to be super-trendy right now just means we have more options then ever. And while the stores are filled with trendy styles (on sale, as the fall stuff starts coming in! ), there’s nothing wrong with the classics. Bored of your basic khakis? Have your white and black chino shorts been in heavy rotation and now you’re just over them? Don’t toss out your old friends just because a few new styles have moved in. A crisp, classic pair of solid colored shorts can be a real staple, but they’re also tailored and can be a little bit boyish. so don’t be afraid to glam them up with girly tops and pretty accessories. They can take it. Here, a few ideas for styling khaki shorts that will work equally well with your white, black or navy standbys. (Psstt…: Don’t forget that pics are linked for easy shopping). Looks, from left to right: 1) A bold colored top and a printed flat; 2) A chic peplum top and metallic slides; 3) A feminine lace top, espadrilles and a cool structured bag; 4) Beach chic with a knotted tee, a tote and flip flops; 5) Play up their preppy side with a white polo, flat espadrilles, and a bold little neck scarf; 6) Ultra-girly with a trendy top, polka dotted sandals and a flowered tote; 7) Tropical style with a colorful cami and fun sandals. For details on the above items, use the links below. The looks above all feature a classic, J. Crew chino shorts, but if your basics need a refresh, check out these khaki shorts for your body type. Sanctuary Habitat Bermuda Short in Real Khaki, $69, Revolve.com, are sleek and chic for a Style Dial 1. 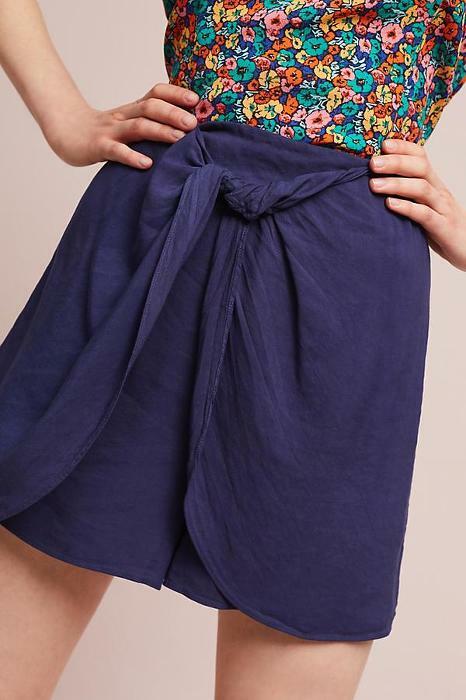 Elevenses Hanky-Hem Silk Shorts, $49.95, Anthropologie, have movement and swing to flatter a Style Dial 3. And now that you’ve brushed up on your basics, let’s talk trends. Denim, soft shorts, printed shorts and skirted shorts are four of the top trends this season, with plenty of options for every budget and every body type. Here’s the breakdown of each trend. You know that rule about how if you were old enough to wear a trend the first time around, you should skip it the second time around? Well, I’m breaking it. (Actually, I break a lot of fashion rules. I’m a rebel like that). My college weekend look consisted of denim shorts (Guess, of course, rolled up) worn with a bodysuit and white Keds. And one of this season’s trendiest looks is pretty much a variation on this: jeans, a top (bodysuits are back! ), and sneakers. How to Wear Them: These go with pretty much anything, from a tee (try a half-tuck, as shown below) to a pretty blouse to a bodysuit. As for shoes, in addition to the obvious (flat sandals, sneakers), try two of this season’s trendiest shoe styles: a slide and a sandal with a low block heel. The warm weather alternative to sweats, soft shorts are, well, soft and flowy and so so comfortable. There are two types of shorts that fall into this category: the supercasual version with a stretchy waist and lightweight fabric, or the dressier pleated version which can take the place of a skirt and is even, depending on your workplace, office-worthy. The Details: Pleated, elastic waist and smocked waist styles all have waist details that require either a tucked in top or a top that hits right at the waist or just below. Anything baggy and oversized can quickly overwhelm and look sloppy. How to Wear Them: Dressy or casual, soft shorts have volume, which is a plus for a straighter Style Dial 3, and when balanced by a sleek top can also work for a Style Dial 1, but if you’re a Style Dial 2 choose carefully. Look for a simple style with just a gathered waist and no pleats, folds or extra volume. Solid colored shorts still have their place, but there’s no simpler way to step up your shorts game then with a pretty print, and they’re everywhere this season. The Details: These are a natural paired with solids or lace tops, or try adding a printed top. Just keep the scale of the prints on opposite end of the size spectrum (i.e. small print on shorts with large print on top). How to Wear Them: This is another trend where a Style Dial 2 might want to proceed with caution. Stay away from bold prints on the bottom unless they are balanced out with an equally bold top. From skorts to wrap shorts to skirted rompers, this combination offers drama, shape and a little extra coverage too. 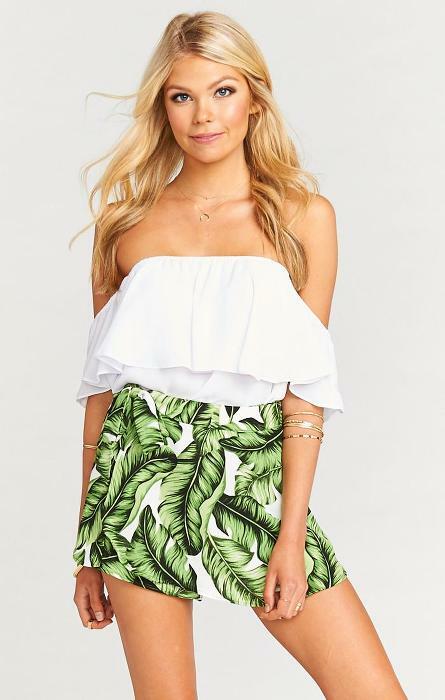 The skort style is the most versatile, of course, as it can be worn just like a regular pair of shorts, but I find a romper with an attached skirt irresistible. The Details: Like many current trends, the focus is on the waist with the wrap-style skorts, so keep tops waist length or wear them tucked in. How to Wear Them: A Style Dial 2 will want to steer clear of skirts with a lot of extra fabric around the hip area, but a Style Dial 3 will find the wrap skorts super flattering. Now that summer is halfway over, I hope that these ideas have renewed your love for this warm-weather staple, whether you stick to dressing up your classic khakis or try every one of the four fabulous trends above. Looking for more ideas on finding a flattering pair of shorts for your body type? Check out this post, one of my all-time most popular.